In a new browser window, create the tabs you'd like to see when you start Firefox, and navigate to your favorite pages in each. Personally, I'm starting with Google, Google News, Facebook, Google Analytics, AddThis, and Blogger. 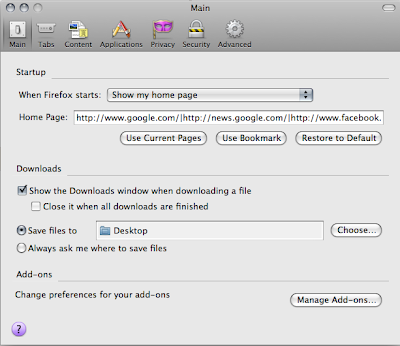 Open Firefox preferences and for Home Page, click Use Current Pages. That's it. Note that each URL is separated by a pipe: | so you can add to or edit the list without juggling tabs.